There is no known cure for One More Turn Syndrome. The future is finally here. 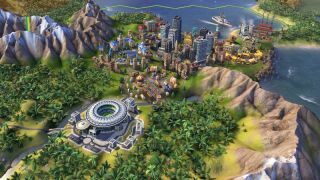 Our jetpacks only work in the water and our hoverboards are crap, but at least we can now save a game of Civilization 6 on PC and then continue it on the loo, bus or wherever else we don't normally find PCs, all thanks to the Switch and the new cross-platform cloud saves. Civ is one of the few games I haven't bought a second copy of on Switch. Into the Breach, Enter the Gungeon, Minit, Stardew Valley and more sit on both my PC and console, and I have no regrets. I don't even need the excuse of cross-platform cloud saves, which aren't yet standard, but it makes a second purchase even more tempting. There are caveats, however, as the Switch version doesn't yet have the expansions, so you'll be stuck with the base game. This does reduce its usefulness, unfortunately, and the expansions add so much that you really wouldn't want to give them up just for a bit of portability. The good news is that the expansions will eventually appear on the console. Well, it's good news if you have the willpower to take the occasional break. Unfortunately, I don't, so expect to find my corpse on the toilet, clutching my Switch.